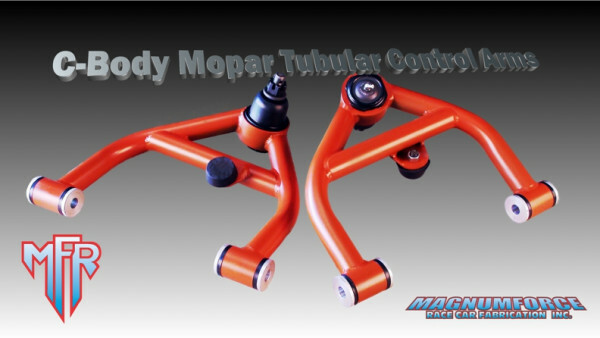 Tubular upper control arms C-Body Mopar. Manufactured from 4130 chromoly tubing. Almost any Mopar owner that has lowered their car even slightly by turning the torsion bars down a few turns has come across the problem of not having enough suspension adjustability after doing so. In trying to get the camber back to specs all of the available caster is lost, resulting in less stability at high speeds. MAGNUMFORCE Tubular upper control arms reduce this by relocating the ball joint further out and toward the rear to begin with which regains that adjustability and more. They also use original style ball joints and delrin/aluminum bushings in conjunction with the stock cam adjusters. Most cars will end up with 3-5 degrees of total positive caster, relative to ride height and the condition of the existing mounts.